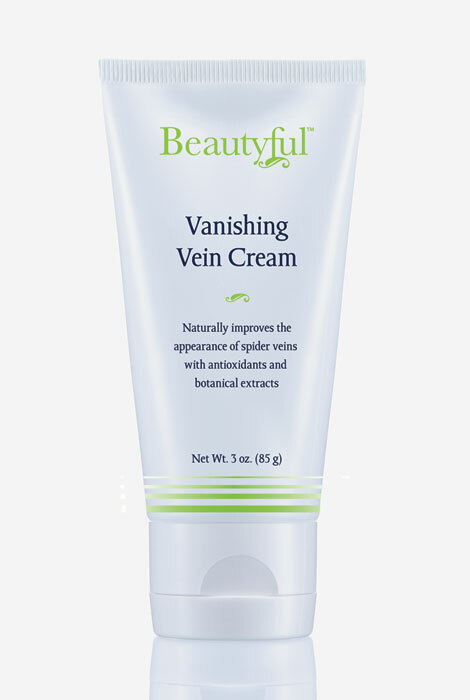 Rapidly absorbing and moisturizing Beautyful™ vein cream combines an effective formula of vitamins and a proprietary blend of natural ingredients to help eliminate the appearance of spider veins, help with poor circulation issues and venous insufficiency. Apply spider vein cream twice daily for results in as little as 30 days. Massage a generous amount into effected areas twice daily. Trying to take better care of my self. First time use since I have developed spider veins. Spider veins on my ankles. I have spider veins around my ankles. Because I need to clear the vein on my thigh. to remove some veins so my legs want look blue and dark when wearing dress or pants knee high. I have never seen a promising spider vein cream before! to lighten or diminish my spider veins but that did not work either. As with any new product I'm hoping this will be the one that will help with the vein problems on my legs. I have dreaded spider veins. Hopefully it will reduce the appearance of some spider veins on my legs. Is there an ingredient list? Dimethicone, Arnica Montana Flower Extract, Ruscus Aculeatus Root Extract, Polygonatum Officinale Extract, Polyacrylate Crosspolymer-6, Propanediol, Cetearyl Alcohol, Cyclopentasiloxane Niacinamide, Ceteareth-20, Cetyl Alchohol, Propylene Glycol, Cupressus Sempervirens Fruit Extract, Hedera Helix Extract, Aesculus Hippocastanum Extract, Hamamelis Virginiana Extract, Glycyrrhiza Glabra Extract, Glycosaminoglycans, Benzyl Alcohol, Ethylhexylglycerin, Tocopherol, Phytonadione, Caprylic/Capric Triglyceride, Allantoin, Tocopheryl Acetate, Squalane, Helianthus Annus Seed Oil, Rosmarinus officinalis Leaf Extract, Calendula Officinalis Flower Extract, D-Panthenol, Camellia Sinensis Leaf Extract, Fragrance, Disodium EDTA. Has this actually worked for a majority of those who have purchased it, or is it just another ineffective spider vein cream? BEST ANSWER: Thank you for your question. We do not recommend for face use. We hope this information will be of help to you. Is there any formaldehyde in this product? BEST ANSWER: Thank you for your question. This does not contain formaldehyde.We hope this information will be of help to you. No, I read through the ingredients and there is no formaldehyde.